Safed's Old City is split into two sections, the Old Jewish Quarter and the Artist Quarter. Many visitors don't see the Artist Quarter but that's a mistake -- it's windy alleys and beautiful old stone buildings offer a lovely area in which to mosey around or even stay over for a few days. It's estimated that, as far back as Crusader times, there were two communities in Safed -- both Jewish and Arab communities. The two Quarters existed side-by-side and shared a central marketplace. The Arab Quarter was comprised of both Christian and Muslim Arabs. Relations between the two sides were never easy, but most of the time the two populations got along, sharing resources and purchasing in a central marketplace. In 1834 the Arabs of Safed, spurred by the incitement of a Musim clergyman, attacked the Jewish quarter and slaughtered up to 500 Jews, leaving many more mained and wounded. The surviving Jews fled to nearby villages and it was only the intervention of the ruling Egyptian governor that restored quiet to the area. In 1929 an Arab mob again attacked the Jewish Quarter. This time the British were responsible for maintaining order but by the time that they cleared the Jewish Quarter, 18 Jews had been hacked to death and numerous others were wounded. The 1929 pogrom convinced the Jews of Safed that they would have to take their defense into their own hands. The Haganah, the Jewish underground, hoarded weapons and hid them in the cellars of Jewish homes throughout the Jewish Quarter. When Arab riots again rocked Palestine in 1936, the Jews of Safed were able to ward off Arab attackers. After the War of Independence the Arab population of Safed fled. New immigrants -- refugees from Eastern Europe and North Africa -- moved into the abandoned homes. In addition to the new immigrants, Israeli artists also came to Safed to open galleries and studios. Early artists, including Yitzhak Frenel and Moshe Castels, had lived and worked in the town since the early 1940s and by the 1950s many of Israel's best-known artists had opened galleries in Tzfat. These artists included Ziona Tagger, Aryeh Merzer, Mordechai Levanon, Yitzhak Amitai, Shimshon Hotzman, David Gilboa and Raviv. Many of these artists were penniless but they shared their resources as they joined together to create the Artists Quarter Association. Today there are new artists in Safed. Some of them have established their galleries in the Old Jewish Quarter, where tourists generally go to see the historical synagogues and other sites. 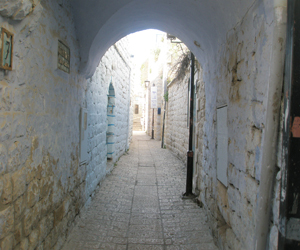 Other new artists have come to the Artist Quarter to establish their galleries in the historical Artist Colony of Safed. Works of the old artists, as well as new Artist Colony members, can be seen at the General Exhibition of Safed.